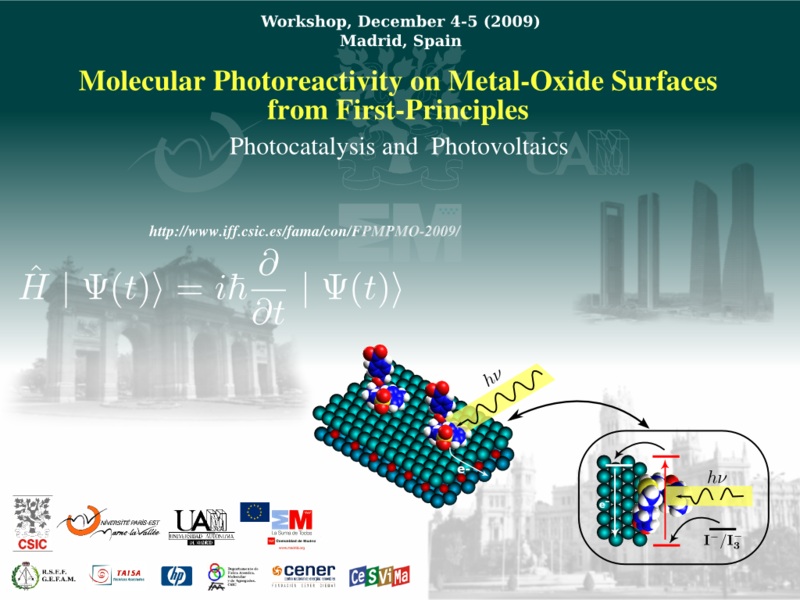 Molecular Photoreactivity on Metal-Oxide Surfaces From First-Principles: Photocatalysis and Photovoltaics, December (2009). The international workshop "Molecular Photoreactivity on Metal-Oxide Surfaces from First-Principles: Photo-catalysis and Photovoltaics" was intended to bring together scientists from around the world, either to present the latest advances of their research in the field or, research from related areas (e.g., molecular photoreactivity and electronic structure methods in gas-phase and gas/metal interfaces). Although the conference had a fundamental theoretical character, experimentalists were also invited to participate, to highlight problems that might stimulate the development of new (first-principles) methodological strategies and combined experimental/theoretical studies of model systems. The main session of the meeting was dedicated to electronic structure methodologies/strategies and computational methods to "attack" the problem of calculating excited states of molecule/metal-oxide surfaces and interfaces, including Local Correlation-Cluster (LCC) approaches, Time Dependent Density Functional Theory (TDDFT)-based treatments, or ab-initio Molecular Dynamics (MD) techniques. Special topics included electronic charge transfer processes (e.g., the electron injection mechanism) in dye-sensitivized semiconductors (such as TiO2), novel deposition treatments on the surface of nano-particles or nano-structured surface metal-oxides (e.g., using helium nanodroplets), and quantum control techniques to address selectively the outcome of photo-reactions on metal-oxide surfaces. María Pilar de Lara-Castells (chair); Alexander O. Mitrushchenkov (co-chair); José Ortega (co-chair); Néstor F. Aguirre; David López-Durán.